"University of Love" is a university that people from around the world come to learn to love each others. She is wearing a camisole one-piece with cream cotton top and high waist skirt made of moss green satin with 2 layers tulle decorated. Her tailored color blazer has 4 colors of dark red, dark blue, beige and orange stripes. The blazer looks very fashionable with gold crown embroided at the left pocket. Her socks are black high-socks and colors on front are different. The left side is blue, the right side is pink coordinated with cream and brown wingtip shoes. She has bright blonde hair with bangs. Her hair is permed curly hair which give her luxurious image. Pink ribbon hair elastics makes her look even more adorable! 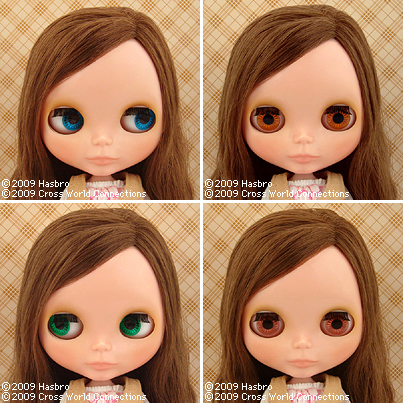 She has special green eye color which match her green eyeshadow and orange cheeks and lips. One-piece, blazer, hair elastic (2 of them), socks, shoes, shorts, doll stand. 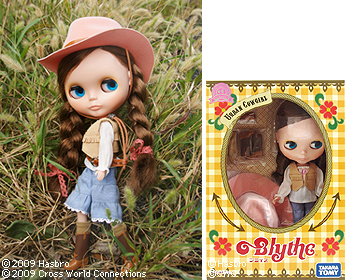 Here comes the new Rodeo star Neo Blythe "Urban Cowgirl" ! She wears a cute smocked blouse with pink stitches, and gathered gaucho pants made from dungarees. The pants look lovely with the white lace trim. She wears a vest with fringe and belt for a western accent. Her coral colored western hat has a matching decoration with the belt. 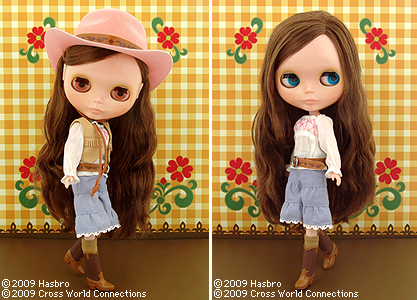 The western boots complete her fashionable cowgirl style! Her hair style is a dark brown wavy long hair parted on the right. Her makeup is a yellowish brown eye shadow with beige blush and lips. Her face type is Radiance, and skin type is Regular. 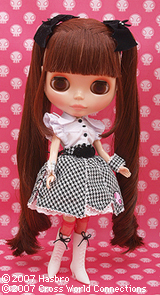 [ The set includes ] Doll, blouse, vest, gaucho pants, hat, belt, socks, boots, underwear, and stand. 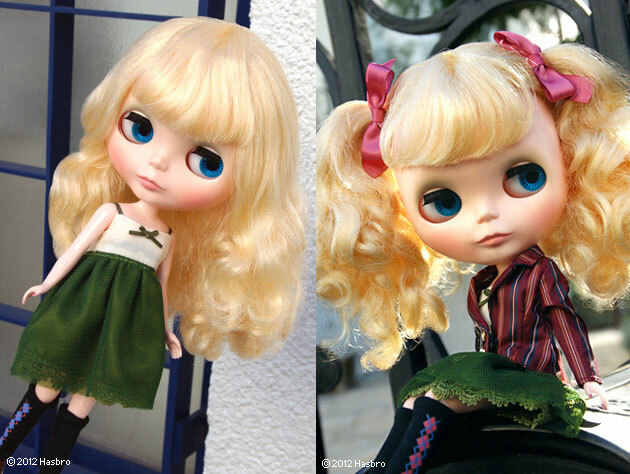 This unique Neo Blythe has a cute punk style that is all her own! With the hounds-tooth pattern, lace, and black and pink combination, she is punk all the way! The front of her sailor collared jacket is slightly open to show her inner camisole. The jacket is designed to attached to the waist with snap buttons. She can dance all night and her jacket will still be in sharp condition. Take off her jacket and attach her bat accessory to her waist to enhance her edgy punk style. The skirt laces up on both sides and she wears a tu-tu underneath to give extra volume to her skirt. For her other outfit, the shirt has flaired, cap sleeves with a bat shaped collar that echos the bat theme add to her cool and cute look. To spice up the shirt, she wears hounds-tooth cuffs. 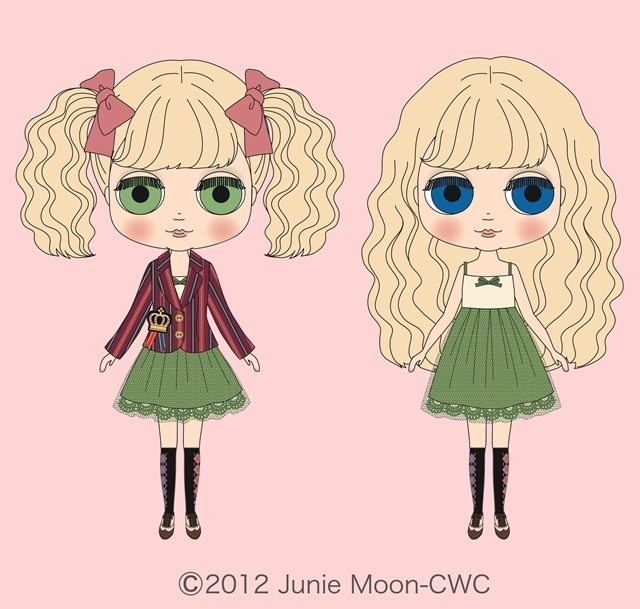 The matching jacket, skirt, and shorts are embellished with lace. The outfit also comes with bat shaped hair accessories and skull bag with bat wings. Also, we are happy to introduce a new shoe design for her cute one strap wedge heel shoes. There are more surprises in her make-up, too! Accented lip lines are drawn on both edges of her lips. Inside her gray eyes you will see a small skull mark. Look close to her charming eyes and see the eyeliner right under the eyelashes and white pearly highlights below her eyes for an attractive new make-over. Her flashy eyelashes are the same quality as human fake eyelashes. The color for her eye shadow, cheeks, and lips are soft orange/beige.Her eyes and make-up are the key to her sweet devilish face. Her eye chip colors are gray, pinkish red, blue, and brown. Her candy like pinkish red eyes are the color of sweet mischief. Her sharp blue eyes are filled with spirit. Her brown eyes add softness to her face. Also, the package design is very special too! Something you have never seen before!! 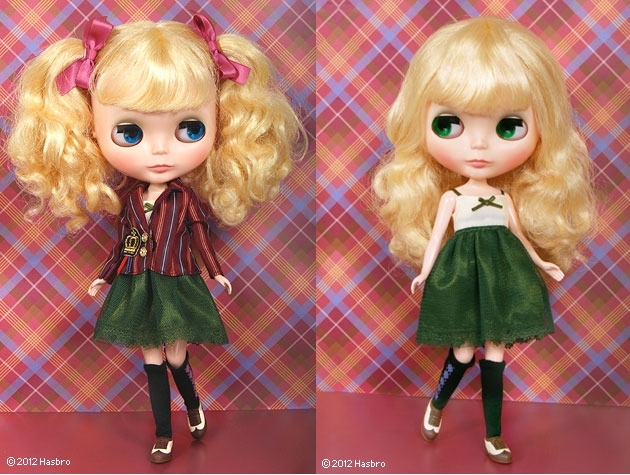 Doll (Radiance), shorts, camisole, jacket, cuffs, skirt, bat accessory for the skirt, shorts, blouse, socks, bats accessories for the hair, shoulder bag, boots, shoes, stand, and collection card.